Camp Borden was established during WW1, and continued as an important army and air force centre and became one of the largest Armed Forces Bases in Canada. The Royal Flying Corps and Simcoe Foresters were the identity of Camp Borden; because of their hard work we have this great training base today. 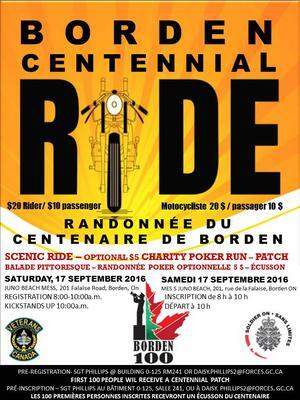 On 17 September 2016 @ 0800hrs CFB Borden will be hosting the “Centennial Motorcycle Ride” event which participants will ride in the surrounding area to honour the fine men and women who fought for our freedom. Proceeds from this event are going to Soldier On. To register or if you have any questions please contact Sgt Phillips at Base Ops at 705-424-1200ext 7906.